With increases in occupancy rates, tax revenue, national media attention and social media followers, Lexington continues the multi-year trend of outperforming the year before. “By choosing our community in increasing numbers, visitors are validating that the Lexington experience is outstanding,” said Mary Quinn Ramer, president of VisitLEX. “Our hospitality partners continue provide authentic, quality offerings that benefit both travelers and residents alike. Tax revenue brought in more than $16 million. Total hotel room revenue topped $190 million. Zagat named Lexington one of the 30 most exciting food cities in America. Vogue recommended Lexington as one of nine U.S. destinations to visit in 2018. TripAdvisor designated Lexington as a Top Destination on the Rise. 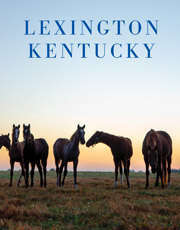 Overall, Lexington garnered more than 1 billion media impressions. The community was featured in national publications such as Condé Nast Traveler, Men’s Journal, USA Today, Forbes, Southern Living and Architectural Digest. Much of this national earned media was the result of VisitLEX serving as host to more than 80 travel writers from across the country. The Visitors Center introduced new merchandise, which resulted in a 37-percent increase in net sales, and it welcomed more than 24,000 visitors. All social media platforms saw an increase and yielded more than 489,000 post engagements and 2.9 million video views. The use of #SharetheLEX content tags on Instagram saw the largest increase with an additional 145,000 tags for a grand total of 370,000 #SharetheLEX uses throughout 2016. Visit http://www.visitlex.com/2017/ to check out more statistics or download the infographic.